The Roman Villa at Brading was uncovered in the 1880's following the discovery of fragments of Samian pottery in the soil turned by ploughing. The villa actually extended from that ploughed field to Nunwell Estate land. Lady Oglander purchased the part not already owned by the Nunwell Estate of the site owned so that it was all under one ownership. Excavations continued over the following fifteen years and revealed three wings of a Roman Villa believed to have been occupied from AD 47 to AD 410. 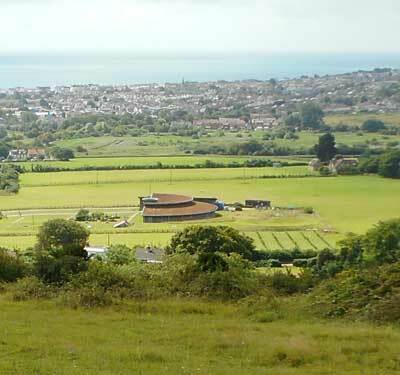 It is located at the foot of the south face of Brading Down and would have been close to the navigable Brading Haven. A number of mosaics were uncovered together with underfloor heating and household implements. In 1900, the Oglander's erected a timber and corrugated iron building over the villa and opened it to the public. In the 1990's, the villa was transferred from the Oglander family to a charitable trust. In 2004 a replacement building was erected over the main villa and the trust has developed the site into an educational facility and tourist attraction.